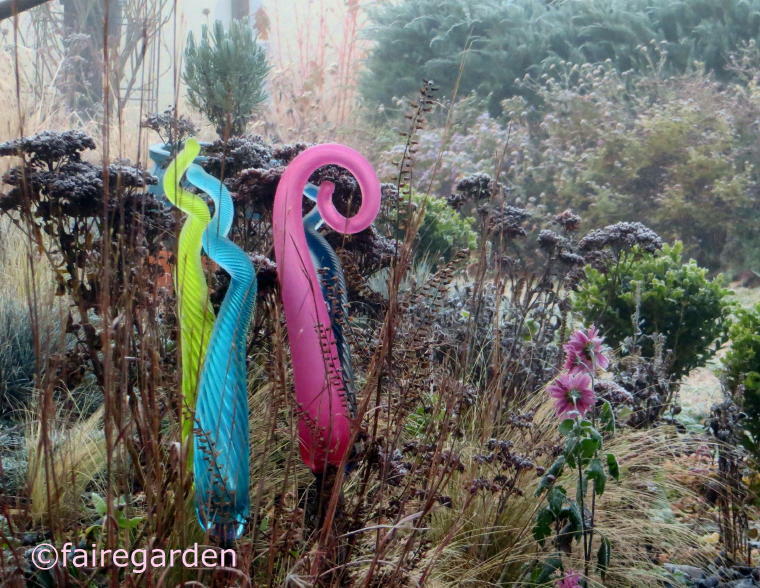 This is the final post about my visit of The Garden at Ringmer Park. 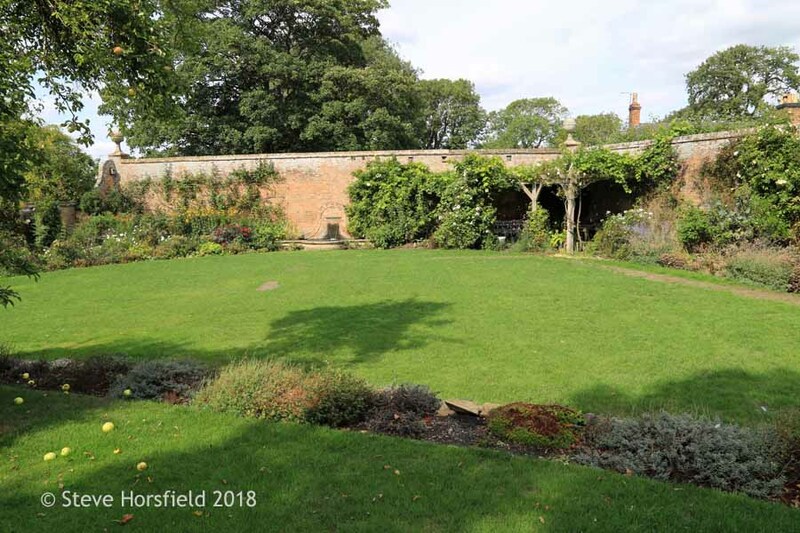 There was more to discover in this wonderful garden than I have shown so far (click here to see post part I and here to come to post part II). The next highlight was a long double herbaceous border of mainly blue, lilac and purple flowering plants. The photo above gives you a good idea about the color scheme used in this border. Unfortunately many things were just starting to flower, but you can imagine how beautiful it must be when the whole beds are in full bloom. I don't know how long this border is, but it is probably the longest one that I have ever seen in a private garden. The very large trees surrounding the border are adding another wonderful tough and complete the picture. How great it is to be able to have a garden with many mature old trees! I thought a wizard came up with the plant combinations in this part of the garden. ...and so were the alliums, which are used extensively here. And these two plants go so well together. ...so monotony wouldn't become an issue. I was so smitten with these irises. This was quite a colorful beauty, too. Another plant that unfortunately I don't know the name of. It seemed to be almost common in England. The stone columns at the end of this long border were very magnificent, in their classic elegance conquered by a wisteria, which just started to bloom. This plant was bursting with energy, you could almost feel it grow. If I only had a few feet of this border in my own garden, I would be a happy person. By the way, I read in the info sheet written by the owner that was handed out to every visitor entering the property that in summer they work 120 hours weekly in this garden to keep it looking pristine. That gives you an idea how demanding and labor intensive the maintenance of a garden like this is. How great that people are willing to put that much time, effort and resources into their gardens, that something as beautiful as Ringmer Park can exist. I am not a hundred percent sure anymore, but I believe that this photo shows the outer side of the long double border featured in the photos above. This garden was just so masterfully done in each an every way. There is one last small corner of this extensive garden that I would like to show you. I think it illustrates perfectly that you can learn something from visiting a huge garden, take it home and make use of it in your most likely much smaller patch of land (at least mine is). What a refreshing bang of color you were confronted with here. If you are not a fan of tulips so far, these ones may make you change your mind. Although a little bit tattered already this one just stopped me in my tracks with its incredible play of colors. ...and just let me hit the shutter button of the camera. I guess this is the most extraordinary tulip that I have ever seen and I am so glad that we didn't skip this part of the estate. Still after taking in all the gardens my husband and I were more than ready for some refreshments. The tea and cake at this place was as delightful as the gardens themselves. Well, we are back home from Great Britain and have returned safely and happily to San Diego, to our home and garden. My husband and I both had a very hard time to leave England and accept the fact that our annual vacation is over already. The two weeks that we spent there just have gone by so fast. But they flew by, because we saw so much and simply had a wonderful time! Still we both couldn't let go completely so we tried to bring a little bit of England home. Besides other things we bought a Union Jack flag, which is now proudly flapping in the wind in front of our home. Sadly we missed all the Coronation Jubilee Celebrations so we figured the least that we could do is showing our willingness to join in by getting the English flag up. But back to gardening. As you can see on the photo above the spring flush of the 'Climbing Iceberg' rose below the flag was over when we returned. Is there a more ugly thing out there in the garden than a not deadheaded white rose, which is clinging to her brownish dried up blooms as if her life is depending on that? As a matter of fact the spring flush was over for all of my roses planted into the ground and they were in desperate need of deadheading, all at once of course. Coming home and having to deadhead all the roses made me feel very overwhelmed and it doesn't help that due to other responsibilities and demands in my life I have succumbed to being a "half an hour"-weekend gardener, which neither I or my garden like. Do I have to mention that I don't get the job done? So since a few days I have decided that I have to try to squeeze out of my busy schedule half an hour a day to tend to the gardens. Because it is very warm here already most of that time is used to water my plants in pots or in the beds were we don't have an irrigation system in place, but I also do a little bit of the deadheading each time I am out there. So hopefully slowly but surely I get the garden back in control, again. It looks a bit better now already than on the photos in this post! By the way what actually didn't help at all with my feelings of being an overwhelmed gardener is that every one of the English gardens that we visited looked so well maintained. I simply don't get it how the Brits are doing it. Above you see a photo of my Hybrid Perpetual Rose Bed. 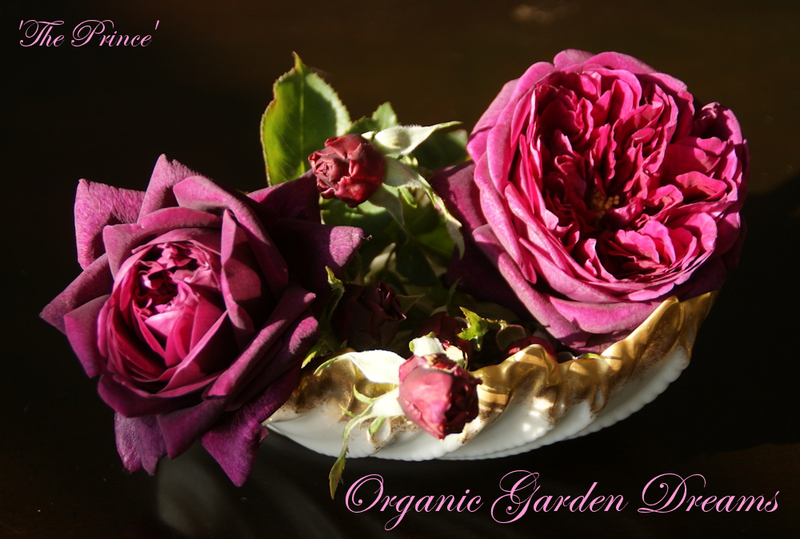 From the left to the right: 'Grandmother's Hat', 'Reine des Violettes' and 'Yolande d'Aragon'. I was quite pleasantly surprised to find that all three roses are blooming already again. Of course, their second flush, if you even can call it like that, is much less floriferous than the first, but still they are repeating. Last year they just produced a spring flush and that was it. Besides the roses being in a bit of a desolate state there were also very lovely surprises in the garden like my relatively new hydrangea 'Nikko Blue'. The hydrangea is squeezed in between a huge Queen Anne Palm on one side and a Giant Bird of Paradise, strelitzia 'Nicolai' on the other and I am sure it is fighting a battle for life because of the extreme root competition, but it still managed to bloom profusely. The blooms are even showing a light blue tint, which is so much coveted by me. Here is a close-up of one flower of the above mentioned 'Nikko Blue' hydrangea. Isn't the subtle play of colors in just one bloom truly delightful? Not all roses look bad right now, though. Some of the ones, which are still living in containers do actually very well like this one. It is a Hybrid Tea rose called 'Halloween', which I got as an own root band last year from Vintage Gardens nursery. The color is absolutely stunning and so is the fragrance. The blooms are huge for such a small rose and indicate that they will be humongous, once the rose is more mature. I have to admit that usually I am not into hot colors especially when it comes to roses, but this one is an exception. I think it is just plain gorgeous. 'Halloween' is a descendant of the famous 'Peace' rose and has obviously inherited some of the qualities of its parent: the flower shape, big blooms, great scent. I think it has more petals than 'Peace', which I consider an advantage, since I just love the sumptuousness of many petaled roses. In my garden 'Halloween' shows a little bit of a powdery mildew infection at the moment, but it is not too bad in comparison to some of my other roses. My dark purple gladioli are blooming so prettily in the front yard. Here you can see the whole gladoli patch together with 'Black & Blue' salvia and rose 'Our Lady of Guadalupe' in the foreground. I really like the color combination and the different shapes of the flowers and leaves. The gladioli corms have multiplied quite nicely from the six original ones in the last three years and now they have some true impact when they are at their peak. There is one catch though, the show is over fast, but I like the excitement that a plant delivers, which becomes the star of the garden for a short time and then goes back into the shadows until next year. Also 'Mme Isaac Pereire' has managed to squeeze some blooms out. What can I say, this rose is one of the most beautiful roses ever bred in my opinion and the fragrance is so strong and pleasing to the nose. Another hydrangea that is really doing well. I got it as an impulse buy at Home Depot last year. Unfortunately it came as an unnamed variety. This is 'Charles Rennie Mackintosh', a David Austin English Rose, which I am getting more and more fond of. It has a pink flower with a lilac tint, which I was unfortunately not able to capture well with my camera. Believe me it is a truly special color in reality and in my opinion well worth growing for that reason alone.